I recently joined the army and currently deployed in Afghanistan. We do PT once in a while, but not near as much as I would like to. So every night I go to the gym and run one mile as fast as I can on the treadmill. it started around 7.30 min, now I'm getting it down to 6 min. Then right after that I lift and work mostly my upper body. Everything I've read says that its unhealthy to start out really hard. And yes it is about speed speed speed for me, That is how I measure how fit I am. I've been doing this for about 2 weeks now and my body feels fine. I don't see an injury happening at all. But another question... I haven't been eating regulary.. how will that affect me? I usually eat breakfast just to jump start my day. then nibble on peanuts and juice to keep the metabolism going. I don't feel dizzy or anything after my intense runs either. so now u know my situation, any information or tips would be great. I'm trying to get that lean, toned, chizzled runner's body. I'm currently 170lbs. and 5'10. 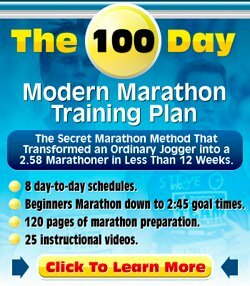 Thanks for your running training/fitness question. I have been away on holidays, so apologies for the delays in the answer. Most running training advice you see on the web is written by people who like to run longer distances like myself. This means there is a lot of focus on easy, slow runs, a smooth build-up and increasing mileage. A lot of advice is also geared at beginners, for whom I would always, always advocate to start off slowly. You obviously have got some basic fitness. As a serviceman you need to be fit, you are probably subject to a periodic army fitness test as well, so you are not starting from zero, which can make it okay to do the type of intense running you do. I do think there are some things that can be improved. Your goal is to become leaner, more toned. By the way, don't know if you have seen any photos recently of top runners, but if they are long-distance runners, many of them would be best described as unhumanly skinny, not toned. In order to become more toned, I would advise you to do a structured weight lifting / resistance program to which you add cardio three times a week. Cardio can be running, cycling, the elliptical machine, etc. Make your cardio sessions 30-45 minutes in length, and yes, I would recommend building up to that... :) In those cardio sessions you would do mostly easy work, but towards the end you can exhaust yourself by making it a lot tougher. When I am on our stationary bike, the resistance goes from setting 1 to 8. I start off in setting 1 and every 3-5 minutes (depending on the length of the session), I push it up one. Trying to keep the pedals going in a steady rhythm. In the beginning it is easy and a bit boring, but by the end it is very hard to keep the pedals moving. Another way of training which I do on both the bike and while running is including short sprints, e.g. Go easy for 3-4 minutes, then go fast for 1. And keep that going for 30-45 minutes. There is plenty of stuff you can do with hills and in-built programs as well. Regarding your upper-body work, try to do this in a structured fashion, i.e. know which exercises train which muscles, keep track of how much you were lifting the previous time, etc. A good basic way to do resistance training is to do 2-3 sets of one exercise and make each set last 8-12 reps and to train each muscle group via 2-3 different exercises. When you can do 3 sets of 12 reps of an exercise without failure, and you can do that two workouts in a row, then it is time to move up in weight. That way you keep on improving yourself and pushing yourself a little bit more. Do take into account proper rest between sessions as well. You need to give your muscles time to repair themselves. You will get better results if you don't train the same muscle group two days in a row. So on day 1 you could focus on biceps, shoulders and back and day 2 you could do triceps, chest and whatever other kind of muscle groups there are in the upper body (I am a runner, not a fitness guru). Another important part of training is nutrition. You may be able to keep yourself going on the diet you describe, but you are most likely not getting optimal results. You need your food to refuel. You want to restory energy supply and feed your muscles with the stuff they need to get stronger. Make sure you eat your lean meats, plenty of vegetables, green leaves and a good, but not big portion of carbs. It goes too far to describe a whole dieting program here. Check out some good information about this type of stuff in magazines like Men's Fitness or Men's Health. Best of luck and keep safe.